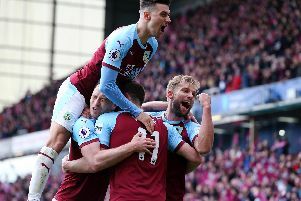 Clarets boss Sean Dyche had no complaints after being leapfrogged by Spurs into sixth after a Harry Kane hat-trick at Turf Moor. Deli Alli was booked for a reckless challenge after three minute on Charlie Taylor, and then won a penalty after Kevin Long hung out a leg in the area three minutes later. Kane netted from the spot and added two more in the second half to earn Spurs a deserved win. But all the talk after was about Alli, though Dyche typically wasn’t getting carried away by the incidents and their influence on the game. He said: “I don’t think there’s too much frustration, there’s frustration in some decisions, but not decisions that would necessarily change the event, only a sending off, because they were excellent. “Simple as that, they were the better side. “(The yelllow card) is a tough one, some of the referees talk about an orange card where it’s so awkward they’re in debate about it, and it’s probably one of them. “It’s a poor challenge in that he’s never going to get the ball. In bygone years it’s just a yellow and we get on with it. “Now, we’re talking about whether you’re in control when you challenge, so it’s a tough decision for the referee. “The penalty is a tough one as well. Kevin Long is learning at this level and doesn’t need to make the challenge, but he gets a toe on it, he’s going down and then the contact comes. “That’s the only frustration, but clever players will make the most of it, and it’s more gamesmanship then. And Dyche was annoyed at the failure to give a penalty for a foul on Ashley Barnes, and to see Sam Vokes’ header ruled out for a foul on Hugo Lloris: “I think the amazing one is Ashley Barnes, it’s impossible he doesn’t get a penalty. Their defender is the wrong side, jumps across him, elbows him in the face and nearly scores an own goal. It’s a penalty. “It would have been incidental, 3-0 down, but you still want those decisions. “Vokesy’s is another one, I can’t see a lot wrong with it. If that was a centre forward winning a header against a centre half 30 yards out, I bet he doesn’t give a foul. But he gives it on the keeper.